Earlier this year I visited Tromsø in northern Norway where a Statoil oil rig had left, for the first time in 20 years, to open up a new oil frontier in the melting Arctic. 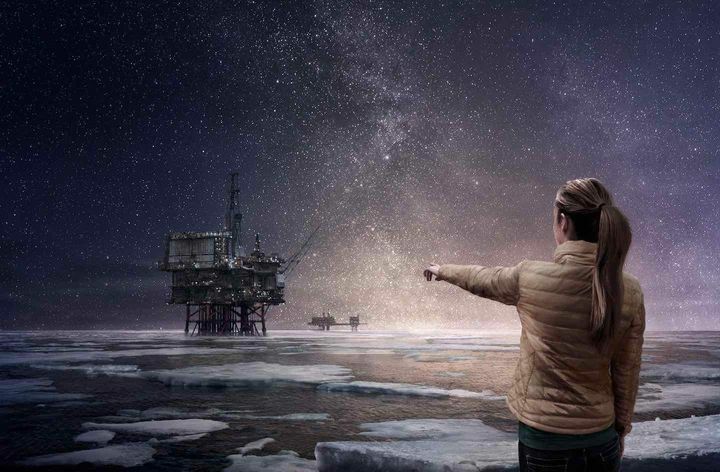 You heard me right: in the age of global climate change, when we most need to keep new fossil fuels in the ground, the Norwegian government has opened up a brand new area of the Barents Sea, above the Arctic Circle, for oil drilling. Just as President Trump wants to. Only a year ago Norway was among the first countries in the world to ratify the Paris Climate Agreement and has, by ambitious targets, promised to reduce its emissions, lead by example and invest in a greener, cleaner future. Norway is already, for example, one of the top countries in the world when it comes to introducing new electrical vehicles. In January this year 37% of all new cars sold in Norway were electric. But by allowing new exploration drilling in the Arctic, just weeks after putting their climate promises on paper, the Norwegian government is contradicting itself; as if it’s trying to put the brakes on climate change, while stomping on the gas pedal. The Barents Sea is experiencing the lowest sea ice it has ever seen. It is utterly irresponsible to go out looking for more oil on a planet that is being steadily overheated by the oil we have already dug up and burned. The Norwegian government knows this. They know that there’s enough carbon in the oil wells, gas fields, and coal mines already in operation to take us past the two degree target they agreed in Paris. There is no justification for exploring for new fossil fuels, in Norwegian waters, American waters or anywhere else. This is doubly true for risky, high-cost extreme oil fields like those found in the Arctic. We’ve already got far more carbon than we can afford to use. This doesn’t mean the world has to grind to a halt tomorrow; existing oil wells, gas fields and coal mines, could be allowed to begin their natural decline, if we use this time wisely to replace them with renewable energy. But it does mean developing new fields is not an option. A new oil field is a hideously dangerous weapon, one that will accelerate the ongoing disaster of melt, drought, flood, and fire and cause immense suffering around the world. “Every person has the right to an environment that is conducive to health and to a natural environment whose productivity and diversity are maintained. Natural resources shall be managed on the basis of comprehensive long-term considerations which will safeguard this right for future generations as well.” (see §112 of the Constitution of Norway). This will be a case of The People vs. Arctic Oil. But what happens in a court in Oslo will affect all of us, not just the Norwegians. Climate change doesn’t recognize national borders. Since Greenpeace and Nature & Youth filed their lawsuit, demanding that Norway upholds its constitutional guarantee for future generations, the Norwegian government has allowed an even more extensive search for oil in the Barents Sea, making the outcome of the case even more important. This needs to be the year where we take back the fate of our future from reckless politicians, and I believe we have the tools and resolve to do so. Unless we act, climate change will cause more dangerous and more frequent extreme weather events and sea levels will rise. This is a crucial moment. It’s time to show politicians and companies that we choose people over oil. Bill McKibben is the author of a dozen books, including The End of Nature and Deep Economy: The Wealth of Communities and the Durable Future. A former staff writer for The New Yorker, he writes regularly for Harper's, The Atlantic Monthly and The New York Review of Books, among other publications. In April 2007, he organized the Step It Up National Day of Climate Action, one of the largest global warming protests to date. He is co-founder and Senior Advisor of 350.org, an international grassroots campaign that aims to mobilize a global climate movement united by a common call to action, and is a founding fellow of the Sanders Institute. He is a scholar-in-residence at Middlebury College and lives in Vermont with his wife, the writer Sue Halpern, and their daughter.